We love naturally curly hair for up-dos! It has so much texture and body already! Naturally curly or straightened hair? It’s hard to decide on one style for your wedding. There are so many choices! Up, down, half up, curly or smooth, to the side, braids, bun, chignons or twists! You could look at a million pics of brides and updos and still not be sure what you’d like. It’s very important to do a trial before the wedding so you can make sure you like the style you’ve chosen. Some styles look great in photos but when you try it on yourself it’s not quite the same. You should feel comfortable and feel like yourself with the style you’ve picked. This pretty bride has naturally curly hair. Initially, she thought that she’d like her hair straightened and then styled up. As you can see in the photos her hair did straighten very well. I notice that many brides feel that if they have curly hair everyday that straight hair is more dressy for them because it’s something they don’t do all the time. 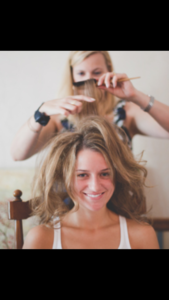 If a bride has naturally straight hair, then curly or wavy and textured is dressy for them. This bride tried both. Glad we did…because she liked the curly style better. It felt and looked more like her. So many styles look different just because of the texture of your hair. This is the same up-do done on two kinds of hair. One curly and one straight. Curly hair has more movement and volume. It’s best to make sure that your curls are not frizzy or dry. There are lots of products that help curly hair to remain calm and still be full. Straight hair can be teased fuller but will look smooth. It’s just about what you like the most! Go Big Hair or Go Home! No one wants flat to their head hair! A nice size bump will add to your overall style. The extra fullness will balance the style as you are viewed from the front. The bigger you start with your teasing the better. It’s easier to bring a big bump down than try to make it bigger. The foundation for every beautiful Up Do is the teasing. 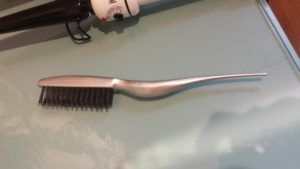 You need this brush! Not a clever name, it’s just called a Teasing Brush. You can buy them in any beauty store or drug store for a few dollars. The bristles are close together and grab the right amount of hair. The end is pointed so that you can go back into the bump after you smooth to get a little more lift. You start with 1/4 inch sections just behind the bangs and pull the section toward the face. Start to pull the brush down on the hair about 3 inch up the hair from the scalp. Brush down toward the scalp about 3 or 4 times. Continue to the back the top of the head with these sections, holding the hair forward. You can pick up the previous section with the new section so that they are teased together. Once you have all of your sections done just past the crown of the head, you can pull them all back and smooth over the top. Don’t brush too much or you will remove the fullness. You can pull down the bump as much as you like. I like to add a couple pins to hold it in place. Once that’s done, you can do a ponytail or continue with the rest of your style. It takes some practice, but you can be a pro in no time!